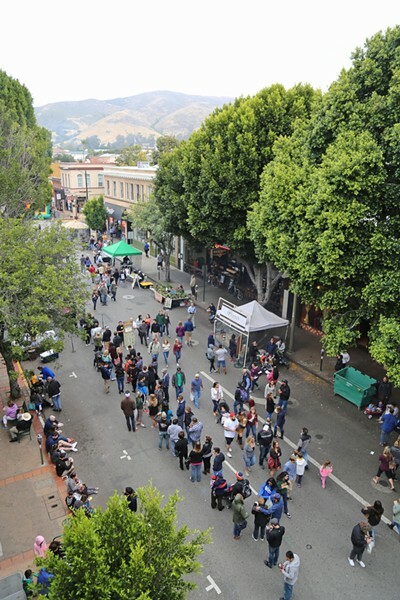 Imagine a typical San Luis Obispo downtown Farmers' Market just before 6 p.m. Vendors are setting up their stands. People are starting to mosey over to Higuera Street. And city staff members are putting down those pesky sawhorse traffic barricades. Safety first San Luis Obispo is formulating a plan to better protect its weekly farmers' market and other downtown events from possible vehicle attacks. Now, imagine if instead of flimsy sawhorses diverting traffic, a perimeter of steel bollards rose out of the ground at the press of a button. Located on inroads to Higuera and spaced out just so, they'd ensure no car besides emergency vehicles could enter the market. Once the event is over, the bollards could retract into the street and out of sight. This is the vision of SLO city leaders, who say they're crafting plans to bolster security for downtown's staple weekly attraction. With acts of vehicular terrorism on the rise—including car attacks last year in Charlottesville, New York, London, Stockholm, and Barcelona—SLO officials say they feel increasing urgency to secure the Thursday Farmers' Market, and other public events downtown, from a similar attack. "You see too many examples of one crazy person," said SLO Mayor Heidi Harmon. "You could do some pretty serious damage pretty quickly." Harmon said the plans are merely precautionary and not in reaction to any specific local threats. The SLO Police Department told New Times the same thing. Harmon added that it's a push of new City Manager Derek Johnson. "It's just being proactive," Harmon said. "It's a recognition that all communities are having to think about the potential security threats we've seen throughout the country and world in outdoor spaces. Communities are having to, unfortunately, really look at this and spend some fairly serious money." According to SLO Fire Chief Garret Olson, multiple city departments—including management, public works, police, and fire—are coordinating to chart the infrastructural plan, which would create a "safe corridor" for pedestrian-only events downtown, including Mission Plaza. The overall concept, Olson said, is to "increase the resiliency of the exterior of the Farmers' Market area," which could involve a "hybrid" approach of permanent but retractable bollards and temporary bollards, in addition to other unspecified strategies. Much of it is still under discussion, he said. "There's no hard and fast plan yet," Olson said. Olson added that any security plan must factor in the city's long-term vision for the downtown, as well as work around environmental obstacles like San Luis Obispo Creek. Any physical barricades must also be able to provide access points and throughways for emergency vehicles. "We want to be really, really smart about it," Olson said. "What does this look like over a five to 10 year time horizon?" Harmon and Olson said the city is expecting to end the current fiscal year with a budget surplus, which is being considered as a funding source for the project. Cost estimates weren't provided to New Times by press time, but Harmon noted that "people are correct to recognize that these are expensive safety measures." The city faces financial challenges ahead, moving toward an $8.9 million budget shortfall by 2020 from rising pension costs. While installing bollards would be expensive, Olson said there would be a menu of options—i.e., hydraulic, electric, pneumatic, removable—of varying costs. "There really has been a lot of advancement in this technology for communities over recent years," Olson said. "Most of the applications [for security bollards] were for military hardening—how do we protect embassies and military installments and the White House? Now what we're seeing is the market producing more features that allow us to have the normal use of our downtown but then can quickly and effectively turn that downtown into a safe place for pedestrian traffic." Olson noted that the proposed safety measures would also deter an accidental car ramming, like the incident at the Santa Monica Farmers' Market in 2003, where an 86-year-old lost control of his car and killed 10 people. "We're very sensitive to what we've seen happen when there are large gatherings of people and how vulnerable people can be," Olson said. "We're moving forward with this with the appropriate amount of haste."